The new Raspberry Pi Model B+ is the biggest change to Raspberry Pi since the Model B Rev 2 upgrade two years ago. Find out what's new with the B+ and how it will affect your Rasp Pi adventures. The first Model B Raspberry Pi was originally launched for sale on February 29, 2012, after nearly six years of development. If you, like me, were one of the people eagerly refreshing their browser in order to get one of the first batch, you might recall that the RS Components and Farnell websites were nearly brought to a standstill with the excessive web traffic. They sold their initial stock in minutes and went on to take hundreds of thousands of pre-orders. In the two-and-a-half very short years since that day, our favorite little computer has racked up some pretty serious sales (with more than 3 million units sold to date), with no signs of the rate of sales tailing off anytime soon. In the early hours (UK time) of July 14, 2014, the Raspberry Pi Foundation announced the latest hardware upgrade – the Raspberry Pi Model B+. This upgrade represents the first major hardware change to the Raspberry Pi board since the Model B Rev 2 hardware upgrade to 512MB of RAM in October 2012. The new Raspberry Pi comes with more USB ports, more GPIO pins, and a new specification that will standardize and simplify the use of add-on boards. If you want a B+ board to try out for yourself, see the box titled "Where to Buy?" 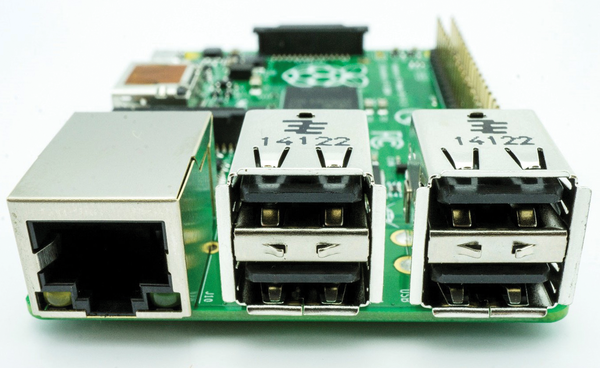 In this article, I offer a glimpse at what you'll find with the new Raspberry Pi Model B+. Whether the Model B+ board you purchase originated from an RS Components or Farnell batch, the first thing you are likely to notice is the new packaging (Figure 1). Both the RS and Farnell packages are significantly improved since the previous plain white box, and the improvements give the product a more professional look. The Raspberry Pi logo is a fantastic representation of what the whole project is about, and it is nice to see it featured prominently on the new packages. It does seem like RS Components and Farnell both got their colors mixed; the Farnell version of the logo looks dark red, and the RS Components version looks positively pink! 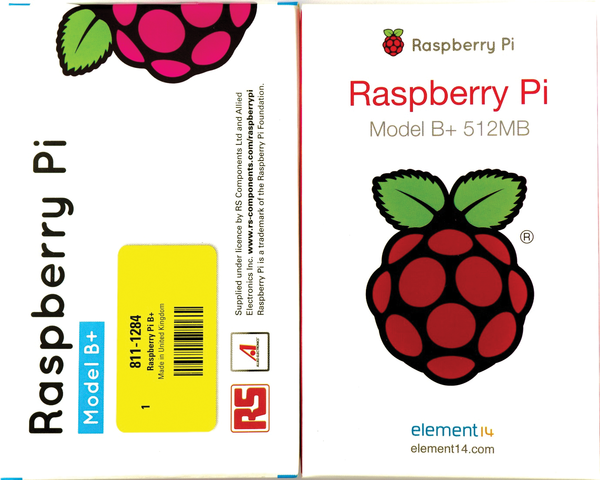 Figure 1: Raspberry Pi Model B+ new packaging. The changes are pretty apparent if you compare the new Model B+ with the old Model B Raspberry Pi board (Figure 2). The most important changes are the inclusion of a 40-way GPIO header instead of 26 on the Model B, four USB ports instead of two, and the slot for a microSD card instead of a full-size SD card. The change to four USB ports is possible because of the new LAN/USB chip (LAN9514). The LAN/USB chip is the little black chip just behind the USB ports. You will also notice that the two double-USB ports that sit next to the Ethernet connector on the Model B+ have moved further onto the circuit board so that the USB ports and the Ethernet connector line up nicely. 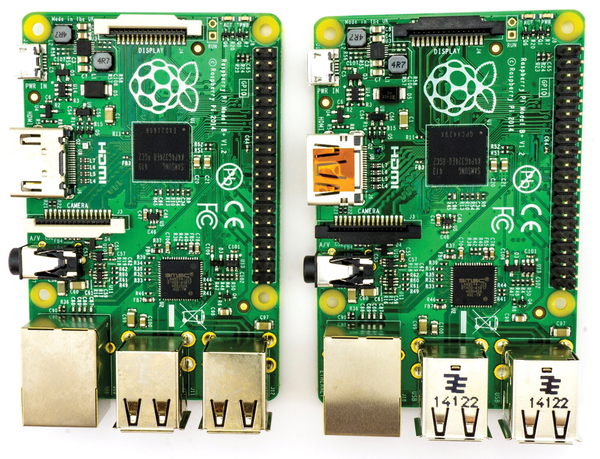 Figure 2: Comparing the Raspberry Pi Model B (left) and B+ (right). Further changes include the relocation of the 3.5mm audio output jack (which now sits between the Ethernet port and the camera connector and features a sleeker profile), the removal of the RCA video output jack (the composite video signal has been relocated to the fourth pole on the new 3.5mm jack), and the addition of four squarely positioned mounting holes (which allows you to attach add-on boards easily, or even to stack a number of Raspberry Pis on top of each other). The new microSD card holder is now of the push-push type, so it is held securely in place (compared with the friction fit of the old holder) and also gives a nice "click" when it is inserted correctly. The developers have generally tidied up the design. The circuit board now has some nicely rounded edges, which don't really add much in terms of functionality, but it looks far superior. Additionally, all of the major ports (excluding the GPIO and DSI connectors) now lie on just two sides of the board, which makes it a lot easier to fit a Model B+ into a home cinema setup without wires trailing from every side. The connectors have shifted around slightly to accommodate the design changes. The top of the board now only has two LEDs (power and activity), and they have been relocated to the same side as the DSI port. The Ethernet connection and activity lights are still present, but they are now sensibly located inside the Ethernet jack itself, which looks great and saves space (Figure 3). Figure 3: On the edge: 4 USB ports and a new Ethernet connector. The Model B+ boards from the two main suppliers have some small differences (see Figure 4). For instance, note the differences in the USB, HDMI, CSI (camera serial interface), and DSI (display serial interface) ports. I am not sure whether these differences are due to the manufacturers sourcing components on their own or whether this is just a coincidence. In either case, the boards are both made in the Sony factory in Wales (see the small text "Made in the UK" at the top left, next to the mounting hole in Figure 4), and they look fantastic. Figure 4: Comparing the Model B+ from RS Components (left) and Farnell (right). Less noticeable changes "under the hood" with the Model B+ include an updated power circuit that replaces linear regulators with switched regulators to reduce power consumption by up to 1W (around 200mA at 5V). These differences in power circuitry are visible in the top left corner of each board in Figure 2, where the large capacitor on the Model B (silver circular component behind the microUSB connector) and linear voltage regulator (big, flat black component directly behind the capacitor) are replaced on the Model B+ with a larger number of smaller components. If you want to find out more about the intricate details of the power circuitry, I highly recommend reading the tutorial on Raspberry Pi power supply differences at the Adafruit website . Importantly, the polyfuse on the Raspberry Pi has now been increased to 2A instead of 1A, meaning you can make use of the additional current that a number of existing power supplies are capable of providing. Part of the reason for this upgrade is so that the four USB ports can now be fed with up to 1.2A between them. The new board also features better overcurrent and hotplug behavior (plugging and unplugging devices while the Raspberry Pi is running), so random shutdowns no longer occur when plugging in a WiFi adapter (or other peripheral) while the Raspberry Pi is switched on. Additionally, the audio circuit now incorporates a dedicated low-noise power supply, which should improve the sound quality; however, if high-quality audio is what you are after, it would almost certainly be beneficial to purchase an audio DAC add-on board, such as those available from HiFiBerry, IQAudIO, and some other manufacturers. 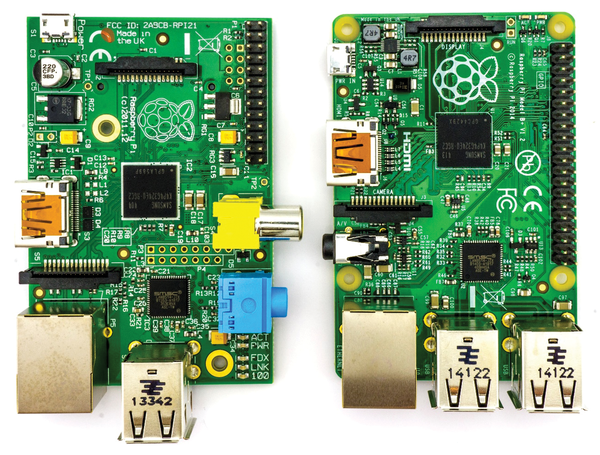 We talk with Eben Upton about the new Raspberry Pi Model B+. As with everything in the technology industry, things move quickly in the Raspberry Pi ecosystem – so much so that it is sometimes hard to keep up! This regular column rounds up the best Raspberry Pi and open source hardware news to keep you up to date on the latest developments, projects, products, and events.